Building an energy efficient house: Tips on where to get the most energy gains. Building an energy efficient house can be accomplished in a variety of ways. One of the best ways is to research and plan before you begin building. One of the first considerations is your budget. Efficiency doesn't have to cost a fortune. There are a lot of energy saving techniques and some are even free to a homeowner who plans. For example, the positioning of your home on your site is one "free" way to ensure that you are taking advantage of nature to achieve maximum efficiency. This is termed "passive" solar...or using the home's design and placement to maximize the home's heating and cooling load. Passive solar designs are a great way to utilize the sun's energy without investing in an expensive active solar system. Passive designs maximize the sun exposure during the cold winter months and helps reduce solar heating during the warm summer months. 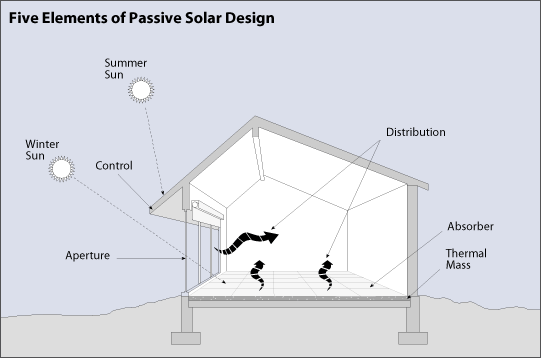 Learn more about passive solar house design here. The placement of your house allows a designer to accomplish these goals and, for the most part, your placement decisions should not greatly affect your budget. Windows and doors are the greatest source for energy loss in a structure. When designing and building an energy efficient house, it is best to locate doors and windows smartly to avoid strong cold winds or searing summer sun. It is also a great area to spend extra money to get a better product. There is a direct correlation between good windows and doors and energy efficiency. Building with ICFInsulating concrete forms (ICF) is a great product to use for your wall materials. This technique utilizes a 6-8 inch core of concrete surrounded by thick polystyrene that forms an energy efficient wall. This technique also provides a a very strong structure that is resistant to hurricanes and tornadoes. Learn more about building with ICF. Blown-in insulation, either the expanding closed- or open-cell type, is another technique in building an energy efficient house. It's a great way to minimize energy loss through the attic. This technique blows this material directly on the underside of the roof deck to create a very efficient insulating barrier. It also drastically reduces your attic temperature and creates a second zone of temperature control above your interior ceiling. These are just a few things to consider when building a new home with energy efficiency in mind.